Our local cherries come from the Gotelli Family Farms. The Gotelli's have been growing cherries in the San Joaquin Valley for over fifty years and currently farm several hundred acres in Lodi, Stockton, Linden and Bakersfield. They have over a dozen varieties and sell to local as well as overseas markets. If you frequent any of the Downtown Sacramento farmer's markets, you will probably see Missy Gotelli selling her cherries under a bright red and white canopy. First picked cherries are usually sent to the Japanese market as the farmers realize a significant price per pound increase as compared to our market. Early varieties include the Burlat and Brooks followed by the more popular Bing and Rainier (often called Royal or Queen Ann) varieties. The season can be short, lasting 8-10 weeks, from the first of May through the July 4th holiday. 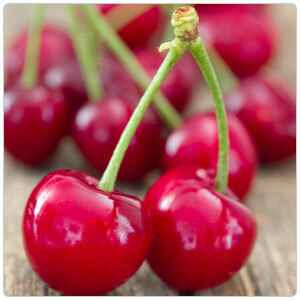 Cherries from Oregon and Washington extend the season through the summer months.